As a younger man, I was obsessed with audio equipment. I invested in expensive stereo receivers, multiple large speakers, and countless components -- turntable, cassette, CD, mini-disc, and more. Of course, I also connected my television and computer. Over time, however, with the explosion of downloadable and streamable media, all of that went away. Now, my living room just has a soundbar and subwoofer hooked to my TV -- Apple TV handles video and music. It is simple, and I like that. So yeah, soundbars are great for living rooms, but what if there was one that was designed for computer desks? Weird concept, right? Yes, but as I have learned from the Sound BlasterX Katana, it totally makes sense. This speaker system from Creative is designed to sit under a computer monitor and provide exceptional sound quality. 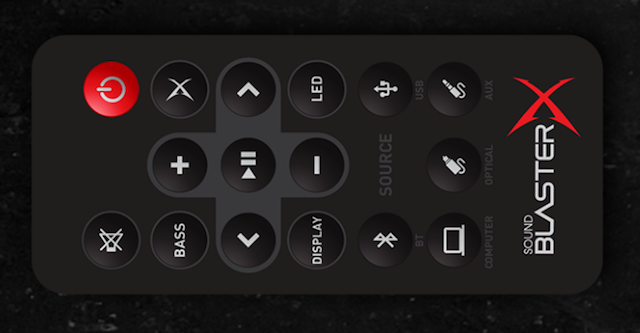 It is not just a soundbar, though -- it comes with a subwoofer, remote control, and has an integrated USB DAC. The box in which the Creative Sound BlasterX Katana comes is quite intimidating. It is quite large, as it not only packs the soundbar, but the subwoofer too. The 5.25-inch subwoofer looks quite nice -- it has a port hole in the front, under which there is "Sound BlasterX" branding. It is surprisingly compact -- its narrowness allows it to be easily hid away under a desk. The soundbar is the star of the show, however, and it has such a beautiful design. It has feet that not only prop it up, but also positions it at a slight angle so that it is better pointed at the listener. There are two 1.3-inch tweeters on the front that are directed at the user, plus two 2.5-inch up-firing midbass drivers. There are three amplifiers (150W total peak power) for each group -- tweeter, midbass drivers, and subwoofer. Creative calls this a "tri-amplified design." All of these speakers come together for an exceptional music listening experience -- superior sound separation. The Creative Sound BlasterX Katana can get very loud, but really, you don't need it to be. Since it is positioned right in front of you, you can enjoy your tunes at lower levels -- a wonderful benefit to others in your home that don't want to be bothered/woken up. It could absolutely be used for a small party or get-together, however. 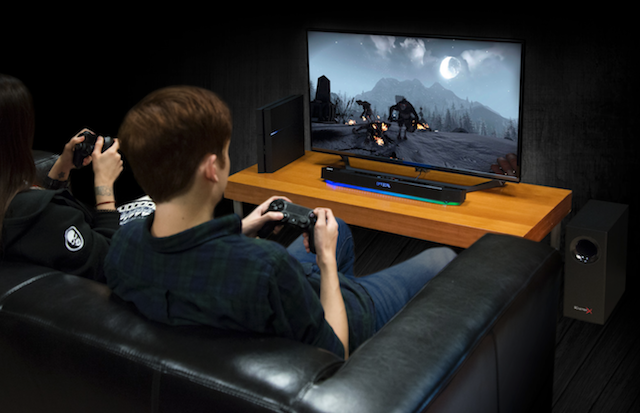 Creative Sound BlasterX Katana gaming soundbar offers superb audio quality when gaming too -- I noticed sounds in games that I didn't before. This could give you an edge by helping you hear opponents sooner. With that said, you can probably have similar results by wearing headphones. While Katana is designed for a PC primarily, you can also use it with gaming consoles too. It will work with any game system using optical or analog, but Creative claims PlayStation supports the USB DAC too! That is quite cool, but unfortunately, I do not have a PS4 to test it. While Creative lists 5.1 and 7.1 support, please know that is just virtualized -- there obviously isn't enough speakers to make true surround possible. It is technically 5.1 Dolby Digital verified, however. There are also several pre-set audio configurations through which you can cycle -- gaming, concert, cinema, night, and neutral. You can customize the whole package further using the Windows-only software. For connectivity, you have four options -- optical, USB, 3.5mm analog, or Bluetooth. If your computer already has a high-end sound card, you might want to use optical, but for the most part, you should use USB. Why? Because that leverages the soundbar's integrated 24-bit DAC. In other words, it has a high-quality USB sound card built in. For most users, whether desktop or laptop, this should be a big improvement over their existing onboard sound. Using the USB connection also gives you the added ability to use the microphone and headset ports -- they are essentially useless when using the other connection options. In addition, using USB enables you to use the remote control to change tracks, play, and pause. If you use iTunes on Windows or Mac, for instance, the Katana's remote can control media on your computer -- including system volume. This is a huge value, that makes the soundbar even cooler. Speaking of that remote, it can do much more than control media on your PC or Mac. It can be used to change source, adjust bass, and control the RGB lighting. Yeah, since this is a gaming product, Creative has outfitted the soundbar with customizable lights. If you don't want that distraction, don't worry -- the lighting can be turned off entirely. You can see the lights in action by watching the above embedded video. The Katana is not just a wired affair -- it can play music wirelessly too thanks to the Bluetooth support. Obviously, using a wired connection will give you superior audio quality, but having the ability to wirelessly connect your smartphone or tablet to the soundbar is definitely cool. Believe it or not, the Creative Sound BlasterX Katana can even play music files from a USB storage drive -- there is a Type-A connection on the rear. In other words, you can load a flash drive with mp3s, plug it in, and play them without the need of a computer. To be honest though, I don't see this feature being used by many. Using your PC or mobile device -- even with those same mp3 files -- would be much more intuitive than blindly using a remote. 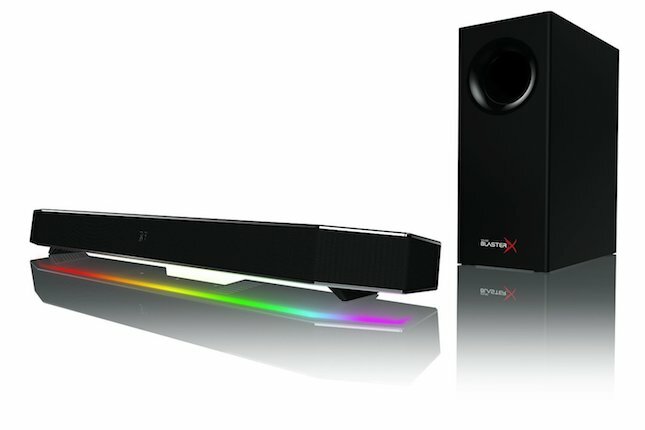 Ultimately, the big questions is, do I recommend Creative Sound BlasterX Katana gaming soundbar? The answer to that is yes. A very big YES. First and foremost, the sound quality is excellent -- you will be blown away. I absolutely love that it includes is an integrated high-quality USB DAC too. By purchasing this product, you aren't just upgrading your speakers, but your sound card too. The $299 drive is totally justified. Sound aside, the Creative Sound BlasterX Katana design is work of art -- it looks beautiful sitting on my desk. The RGB lighting, however, really makes things fun. Quite frankly, the overall design inspires me -- it is fun to just stare at it. Being able to learn back in my chair and control iTunes with the remote is very rewarding too. Highly recommended. Just buy it.